Oh noes! The final episode of "Gravity Falls" is almost upon us (Feb 15, 2016)! 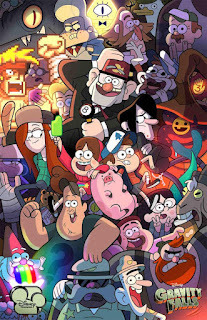 I'll be sad to see this rich, clever, and thoroughly impressive show conclude, but I appreciate that Alex Hirsch, the creator, always had a set story in mind and isn't going to string it along for whatever reason networks do that (money, I guess?). Gravity Falls deserves to be true to itself and not diminish in awesomeness. 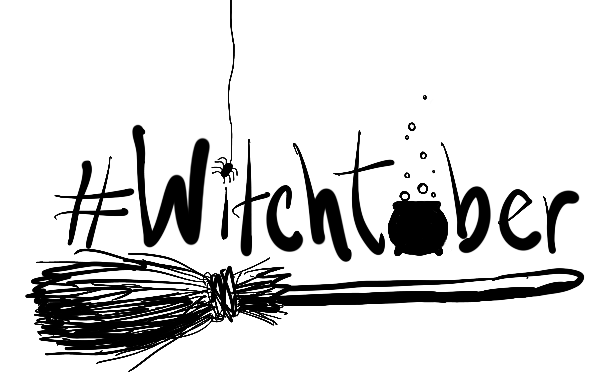 It's like an engrossing book series with a deliberate beginning, middle, and end. Me like-y. ALSO, before I forget, Disney XD is airing a behind-the-scenes half-hourlong special for "Gravity Falls" tonight (Feb 8th) so, there you go. 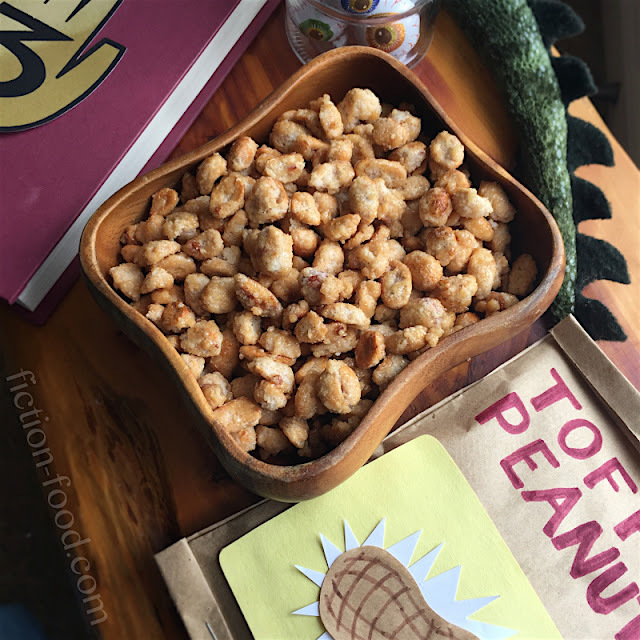 If you'd like a snack to munch on while watching the hourlong series finale, try these toffee peanuts from "A Tale of Two Stans", episode 12, season 2! 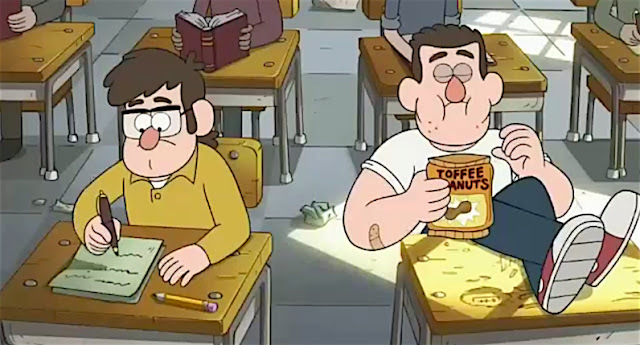 These were Grunkle Stan(ley)'s snack of choice when he was younger and he could be found shoving them into his mouth pretty much all the time, everywhere. Even that one time, upset over the prospect of his twin brother Stanford leaving him to go away to smarty-pants college where Stanley couldn't follow, he snuck into the high school gym the night before the pivotal science faire and wrecked (accidentally!) Stanford's science experiment. The next day Standford's perpetual motion machine doesn't work so the college admissions team denies him admission. That's when Stanford notices the incriminating, empty bag of "Toffee Peanuts". Dun-dun-dun. Thus sets into motion the decade-long estrangement of the Stan-twins, and ultimately, one could say, the whole story of "Gravity Falls" (well, it's about sibling emotions and bonds and falling out and hopefully making amends...but those toffee peanuts played a big part). It is also a lesson in throwing away your trash. For more "Gravity Falls" munchies, try my Gnome Puke Cupcakes, Try-At-Your-Own-Risk Mabel Juice, and Mabel Sweater Cookies! Also check out Feast of Fiction's homemade Smile Dip and Nerd Ache Cakes' Dipper Hat Cake Pops. 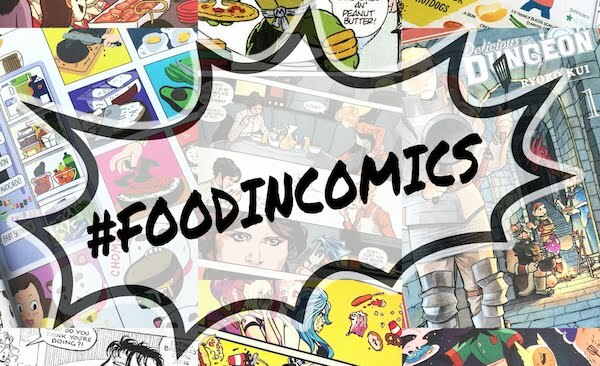 For a whole list of "Gravity Falls" party food ideas, click here! Note: For the recipe below I simply sprinkled the finished nuts with sea salt, but you could sprinkle on cinnamon or red pepper for more flavor–whatever floats your boat! Also, this recipe isn't original to me. 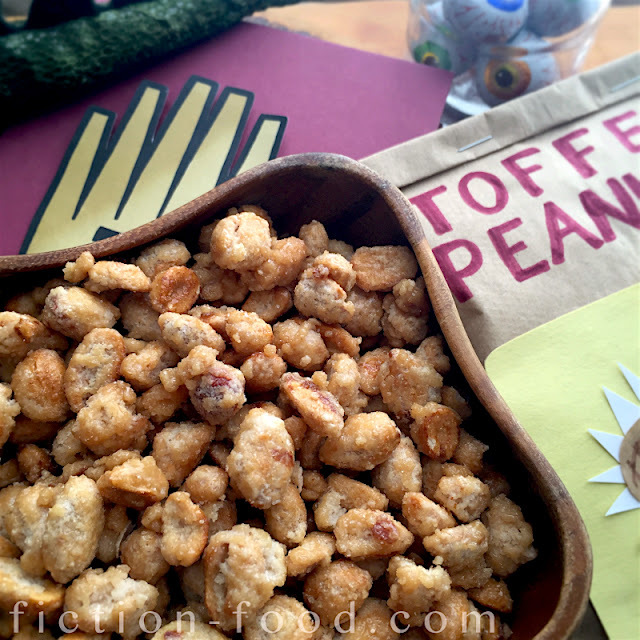 These same ingredients and measurements for toffee peanuts are found all over the internet, so I wasn't sure who to attribute it to. And the measurements are spot on, so no need to fix what ain't broke! 1. Line a large tray with parchment paper & have it ready nearby. In a large pan over medium heat, stir together the sugar & water (I used a silicone spatula for this). Heat for a couple of minutes & then stir in the peanuts to coat. Continue to heat & stir. After several minutes the sugar will dissolve & then the water will eventually evaporate. The sugar will then crystalize again, or seize, forming granules. Lower the heat a little & continue to stir. The sugar will melt & this time it will caramelize. Stir the peanuts well & don't let the sugar burn! Lower the heat a little more or lift the pan off the heat for a moment & stir if it's getting too hot & you think it might be about to burn. You want the sugar to get a little bit brown, but not too dark (see pictures). 2. Turn off the heat & scoop the coated peanuts onto the parchment paper-line tray & then spread them out. Sprinkle with sea salt, let them cool for a few minutes, & then break them up so they aren't sticking together in chunks. Let them cool a little bit more & then they're ready to serve! If you'd like to store them, put them in an airtight container. Gift Suggestion: If you'd like to make a little gift bag for the toffee peanuts, cut the bottom off a brown paper lunch bag so it's about 8" tall & use a glue stick to glue the side flaps together. Lay the cut bag against a sheet of wax paper & fold the wax paper over it twice & cut (so the wax paper will be a little over 10" wide) & then cut it to the same height as the brown bag. Fold about 1/4"-1/2" of one vertical edge of the wax paper over the other & then slide the wax paper into the brown bag "sleeve", lining up the top & bottom edges (trim the wax paper if needed). Fold the bottom of the brown bag up a little over 1/4" & then fold it up again & put in two staples. You've created a pouch! Use yellow construction paper, white paper, & a scrap from the brown paper bag to make the peanut image (see photos & screen shot), glueing it all together with a glue stick. 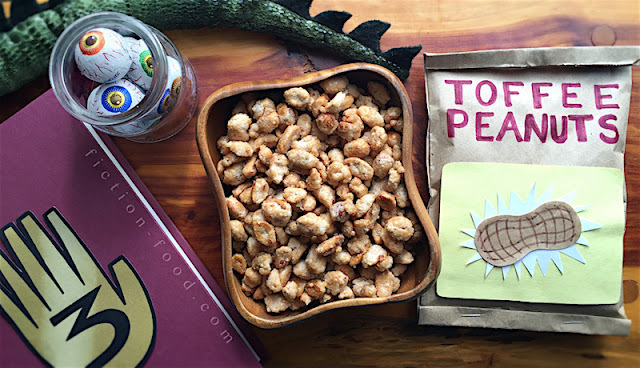 Use a burgundy or dark magenta marker to write "TOFFEE PEANUTS" near the top of the bag, making sure you leave room to fold the top of the bag down. Using a large spoon, spoon about a cup-worth of coated peanuts into the bag & then fold down the top a little more than 1/4" once & then twice & staple it. There you go! Ready to be emptied & left incriminatingly on the floor! 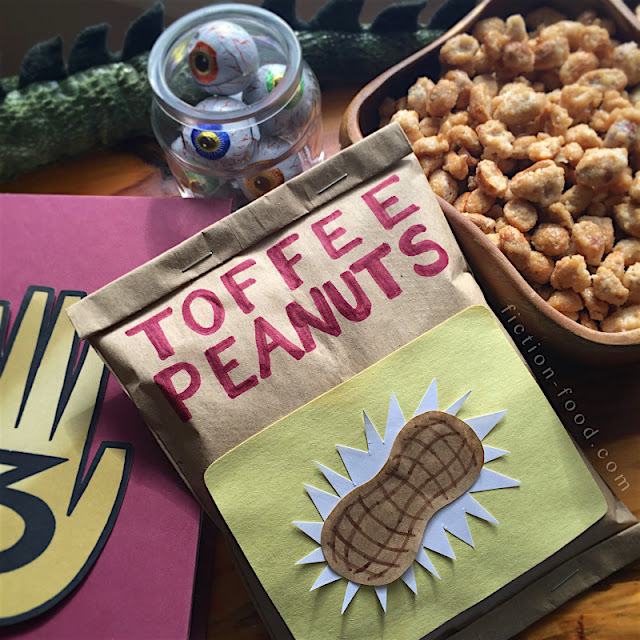 For a list of Gravity Falls party food ideas, click here!